Hunting season is finally near. After what seemed like the longest summer ever, it is now time to prepare for hunting season. You have made sure that all of your gear is in working order. In fact, you have double checked everything. The only thing that is left is to wait for hunting season to officially begin. But have you really checked everything? One of the most common oversights when preparing for the winter hunting season is cold weather protection for yourself. You need to make sure that you have the proper feet and hand coverings to help protect against cold weather. The last thing that you want when hunting are feet or hands that are too cold. Using boot covers while hunting is one of the most effective ways of keeping your feet warm. These boot covers are water repellent on the inside to protect feet from ice and snow. They are 2-ply insulated and they have a drawstring top to give extra protection from the cold. As an additional bonus the boot covers are made with a camouflage pattern so they easiy blend into the scenery when you are hunting. A carry strap is attached to the top of the boots for easy transportation. Many winter activities such as hunting, ice fishing and snowmobiling require you to stay still for extended periods of time. It is imperative that you protect your feet and hands with the right type of cold weather gear. So, when you are going through all of your gear and making sure that you are ready for the perfect hunting season, make sure that you are also personally equipped with everything you need to stay warm. Regardless of how much you may enjoy cold weather and cold weather activities, your feet and hands need to remain protected. Protect your feet with ease by adding boot covers to your list of gear that is necessary for a good hunting season. 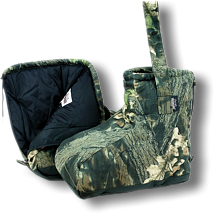 Keep warm using our cold weather hunting gear our boot cover is the perfect cover for you hunting boot. No hunter wants cold feet while in a deer stand so get the best cold weather gear available for deer hunting with our boot and hanblankets.